Technology, we all use it. But do we all need it or is it a case of wanting it? Need and want are two issue’s I debate at least once a year, slight lie. Every time Apple drops another ore inspiring piece of technology, my inner child goes to war with the grown up within. I’m sure you can relate, but now the innovators have turned their beady little eye to our pets. How can our dogs benefit? Like a child in a sweet shop, I have dived into the internet abyss. Exploring everything from motorised toys to treat flicking camera spying devices. Within any search, you’re easily distracted, but I think I have come up with a few suggestions. Activity monitors are an abundance within I our daily lives. Our heart pounding fat fighting regimes beamed to our waiting devices. But, can this tech help our dog’s lives? One product that has entered the market is PitPat. At just £39.99 this one fit, all design that Velcro’s to your dog’s collar. Employing a three-axis accelerometer to identify whether your dogs walking, running, playing or resting. The device then sends the activity data via Blue-tooth to your chosen smart device. PitPat also allows you to cross reference your dog’s data against their database. Providing a better understanding of where your dog’s weight sits within its genetic breed. For the adventurous hound, the Pitpat is good to go, with an estimated battery life of a year and an IP67 Waterproof rating. Your dog can run through all those trails undeterred by those troublesome puddles getting in the way. FitBark does what Pitpat does but is aimed at the whole family with compatible fitness monitors. Fitbark website is a little more polished than others, but what stunned me was that the battery life is 14 days max. They go on to say, “Get plenty of playtime between charges. There’s no need to remove the FitBark from the collar to recharge it’ (FitBark, n. d.). I don’t know about you but every time I bath my dog it takes I don’t know about you but every time I bath my dog it takes me two or three days to remember to but his collar back. In this day and age, we consumers expect our devices to be ubiquitous. But on appearance, the Fitbark is doing all the same things as the PitPat with nowhere near the battery life. Do you need to see, speak, snap and treat your pet? Well if you do then the Petzi treat cam is for you. With a wide angled camera, night vision included, you can remotely monitor your dog’s antics. If you have a sofa jumping poach that snuggles into your favourite seat when you’re at work then you can you catch them in action. If that wasn’t enough then you can share their antics across your favourite social platform. Connecting via Wi-Fi or 3g, video is streamed to your smart device with the ability to talk back your dog. If deserving you can reward your dog’s behaviour with a nice treat. Petzi can be mounted anywhere making it a potential training tool if you wish to stop/encourage certain behaviours whilst away from your property. 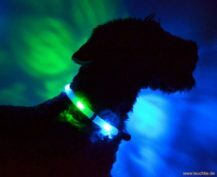 Leuchtie plus is a high-end LED collar that simple slips over your dog’s head. With up to a 100 hour of battery life Leuchtie plus will make your dog visible on even the darkest of evenings or mornings. With a retail of £40 it is certainly more expensive than say some I’ve used from the local pound shop. That said they never last, arguably is a false economy. Leuchtie comes with a 2-year guarantee, automated on/off switch and a very long battery life. Foobler Electronic Timed Treat Dispenser is low tech compare to the other products we have mentioned. There is something magical in its simplicity. With 6 puzzles to challenge the most inquisitive of pooches, the treat dispenser has the makings of hours of entertainment. Basically, it invokes the Pavlov theory, ‘ Conditional Reflex”. (Wikipedia, n.d.) A timer can be set for 15, 30, 60 or 90 minutes. With a bell sounding to indicate that a treat will be dispensed. What drew me to the Foobler is as an owner you not only entertain your pet, your stimulating them in a positive way with a reward that you can moderate. For the more active of dogs I would certainly move any breakables out of the way. With its slick design, pan, tilt camera movement allowing for crystal clear HD streaming to your smart device. Motorola certainly seems to have packed it with some serious functionality. And if that wasn’t enough it even gets an RSPCA stamp of approval. I am chomping at the bit to see this in action, knowing the sneaky little devil of a dog I have. The Scout 85 looks like it could keep up with him. The icing on the cake is, catching my teenager out when they say they have walked him. Got to love technology! Do you have a multiple dog household, Cat(s) and dog(s), do you have to medicate through their food? Is it a nightmare? Surefeed is one expensive bowl, but it is extremely clever. It allows you to program it to recognise a certain animal via their RFID collar, or your dogs embedded microchip. With a single button programming, dinner is sealed within the bowl keeping flies away and food fresh. Your sound in the knowledge that whilst you’re out the designated animal can get to their food. There is even a training mode to help you get started. Even with its high cost, I would consider it to help address the complications our animals can bring. You can easily get distracted with all the products that are on the market today. My suggestion here is to identify the reason you need it. If it’s for the health of your dog then always seek advice, as some tech can be to be overbearing if set up wrong. Whilst we are not Genius bar guru’s, we are behavioural experts in your canine companion. If you have any concerns and wish to discuss your dog with us. We are always on hand to offer any advice to aid your relationship with your dog. Feel free to use our Contact Form to discuss your dog further. FitBark (n.d.) [Online]. Available at https://www.fitbark.com (Accessed 20 June 2017). Wikipedia (n.d.) Ivan Pavlov [Online]. Available at https://en.wikipedia.org/wiki/Ivan_Pavlov (Accessed 20 June 2017).